That venerable workhorse of kid's television, Sesame Street, has been released on DVD. For all of us who spent hours watching endless reruns of Bert and Ernie, Snuffalupagus, Big Bird, and the rest in the pre-Elmo age of Sesame Street, this is a fun trip down memory lane. But the DVDs come with a stern warning that they are for adults wanting to relive their childhood joy, not for children -- the original show is now considered 'inappropriate for current preschoolers'. Huh? "For Grown-ups only". Apparently, Oscar is too depressed and grouchy to expose delicate little children to, and Cookie Monster promotes obesity and dangerous eating habits (sometimes he ate the plate!) and Big Bird was delusional -- he was the only one to see Snuffleupagus for years. Adults befriended children (stranger danger!) and that odd relationship between Bert and Ernie is too difficult to explain to young ones nowadays. Those early episodes could damage the tender little flowers that are modern preschoolers, according to the uber-protective bunch responsible for Sesame Street today. The Guardian in the UK has expressed this very well -- with a sort of bemused horror that Sesame Street is now a dangerous influence. It's not the psychedelic nature of the programme in its 70s incarnation that worries, but the behaviour it might encourage. Children dancing in the street! Grown men reading storybooks to kids - for no apparent reason! Does anyone else think that this is utterly ridiculous? I never realized that children today need to be so carefuly swaddled. When, exactly, will they be exposed to anything that is not Perfect and Sanitized? Are parents no longer capable of talking with their kids about things that are different? I'm really boggled by the desire (which seems to be peculiarly rooted here in the US) to keep children from learning about or integrating into the normal, ordinary world -- where there are conflicts, difficult situations, chores, consequences, and, well, a ton of people who don't have sunshine streaming out their...well, you know. It's as if everyone believes that a child exposed to a negative "model" will instantly and completely absorb that message to the exclusion of any other. 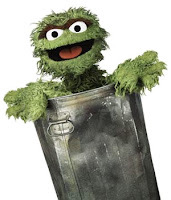 That certainly explains the wrap-em-in-cotton-wool mentality that makes the current producer of Sesame Street say that they probably couldn't even have a character like Oscar the Grouch anymore. That just might be the most depressing thing I've heard in a long time. Ok, I've been missing for almost three weeks. Sorry about that. Family crisis, holidays, you know the drill. Well, by that logic, Mitt: based on the percentage of Mormons in the US, it then seems obvious that one should not be president. Remember The Meaning of Tingo -- that wonderful book that introduced the word uittwaian into the lingo of Chez Phouka? The author has come out with a second volumne -- Tojours Tingo. It's not available here the US yet, as far as I can see. But it's on the list! You can take a quick quiz at the Guardian site to see how well you can figure out some of the new words. I just learned from my mother-in-law that Sweden celebrated National Cinnamon Bun Day on October 4. "This new tradition is just eight years old, and has become a major celebration in the country". No wonder, according to Wikipedia, Cinnamon Rolls were invented in Sweden. I married into the right family, I tell you! I found a lovely (and possibly authentic) cinnamon bun recipe here. And This Day in History blog claims that riots broke out in 1999 when cinnamon prices rose. Not sure if I believe that one. You'll be pleased to know that Clemson University includes it on their calendar (although I wasn't able to find the University of MN calendar, so I don't know if that bastion of Scandinavian-ness includes it!). We do have an American National Cinnamon Raisin Bread Day (9/16), but we haven't adopted this fabulous holiday (which is celebrated in Finland and Switzerland, too. Financial cut backs and underhand dealings. I don’t think that I’ll still be here come May. Phoney emails that say things are improving. Think I’ll look later for my resume. Managers drinking and admins are grieving. IT got word and by droves they are leaving. Hoping we’ll last past the next holiday. I am not their clown. I’ll come and I’ll burn it down! It's too early to be discouraged, but I really don' t like my Nano novel right now. It's just not going anywhere. "I am often asked if I think the university discourages writers; I think it doesn't discourage nearly enough of them."